Monday August 12, 2013 was National Middle Child day! Here you will find some perspective on being a middle child from PBS Kids. We’d love to hear your tips for how you carve out special time alone with each of your kids! Also on Monday, Googaro’s August boxes shipped! Yippee! Be sure you sign up here for your subscription so that you don’t miss out on September! Check out this Googaro write up on Real Mom Media! How cool are these green sprouts® compressed wipes? Offering them in our Googaboxes was a no-brainer since all green sprouts products are free from PVC, BPA, and formamides. On Wednesday we asked if you had anyone other than your partner join you in the delivery room! We loved all the answers we got – seems like a lot of delivery rooms are stuffed full of love! The Mama Maven’s Googaro post has a great video included! Check it out! 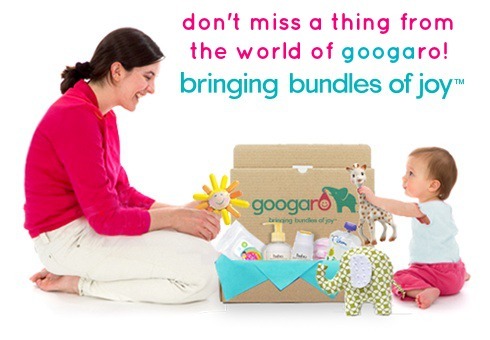 Click here to try out a 1 month Googaro box and see what all the fuss is about! Be sure to use promo code FABFINDS and you’ll get 10% off! Woo hoo! We found a list of 51 must have children’s books! Is your child’s favorite included? Another fab write-up of Googaro by Ramblings of a Suburban Mom! AND she included a coupon code for your use! Last but not least, congratulations to Andrea! She is the final winner of our Nouri Bars giveaway and will be receiving two free, yummy Nouri bars! This entry was posted in Week in Review and tagged Facebook, giveaway, Googabox, Googaro, Nouri, Twitter by googaro. Bookmark the permalink.